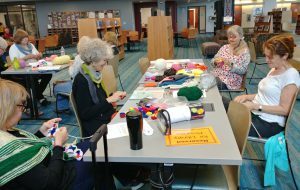 Share A Knit is an occasional program of participatory knitting for Guild-supported community organizations. 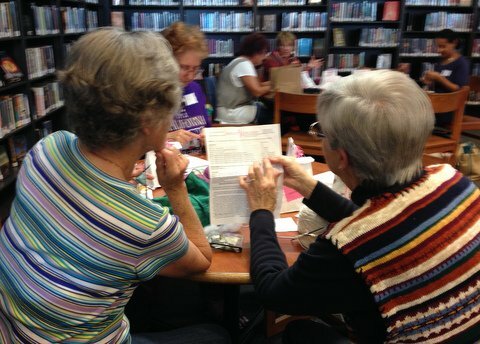 Knitters gather for a few hours to begin, and sometimes complete, a new small project. Completed projects are donated to an organization supported by Guild Philanthropy. 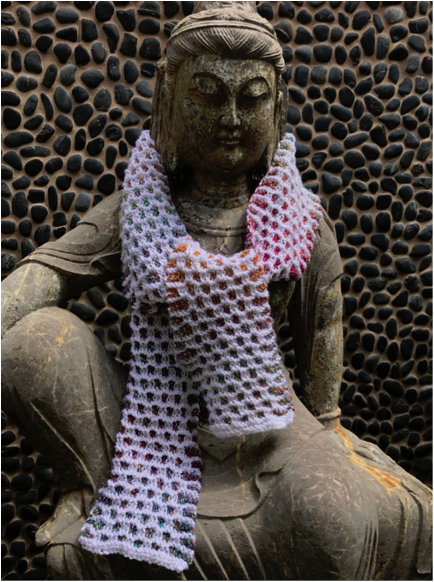 Here are the first two patterns Eileen Adler designed for Share A Knit: Blocks By Design and Dappled Sunlight Scarf. 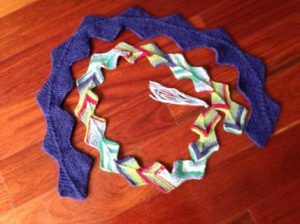 Download the patterns, find some yarn, knit up some gorgeous scarves and donate them to a worthy cause. Many thanks! The patterns used by the Guild Philanthropy Knit-a-Square group are now available for participants to download and print. There are two files, a five-page file of eight written square patterns, and a two-page file of two written blanket patterns. These patterns are provided to SDNCKG members for philanthropic purposes. 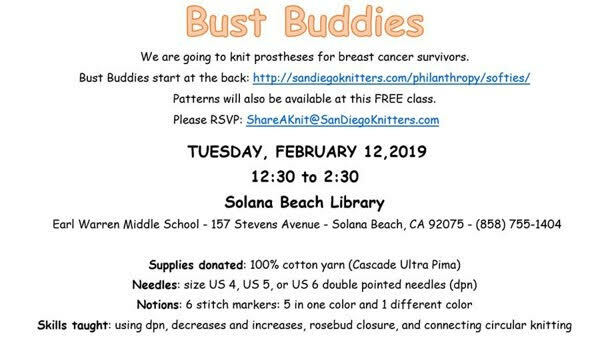 Eileen Adler is hosting a Bust Buddies class at the Solana Beach Library from 12:30 to 2:30. Details are on the calendar. 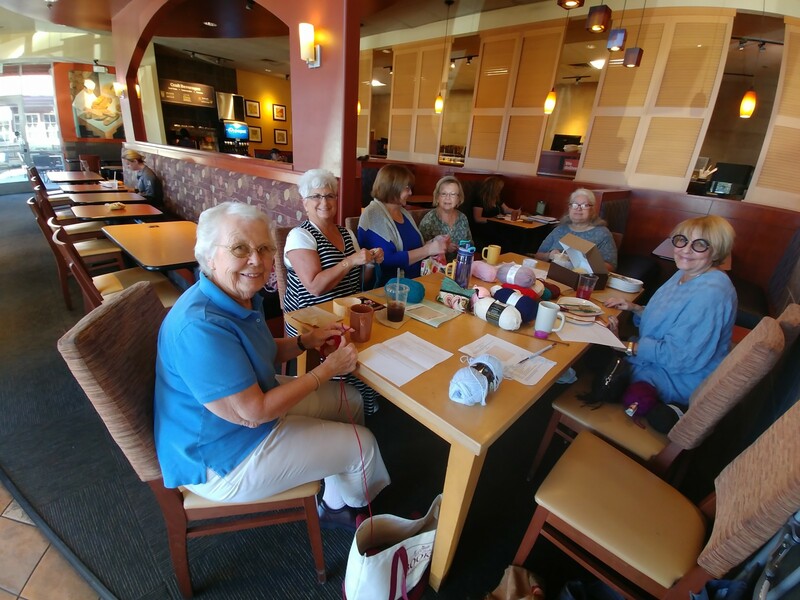 Join us for another Knit-a-Square event at the Panera in San Marcos, to start, finish or work on afghan squares, or start a blanket for Veterans in Hospice. Details are on the calendar. Join us to start, finish or work on a 12″ square for a Linus project blanket. Details are on the calendar. 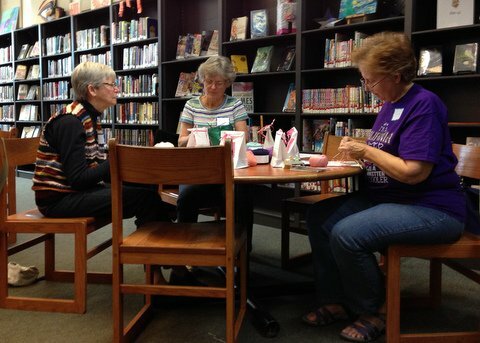 Here’s a group of us at the Knit-A-Square event on October 17! 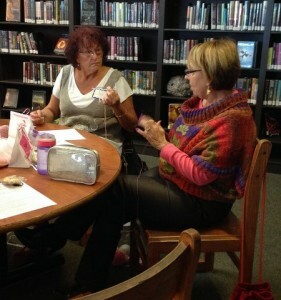 Keep knitting your squares and join us next time! Our next Share-A-Knit event is Knit a Square. Details are on the calendar. Our next Share-A-Knit event is a Doubly Delicious scarf. Details are on the calendar. It’s time for Share-A-Softie! If you have never knitted a Softie, or better yet, if you have not used double-pointed needles, this is your opportunity to learn. Details are on the calendar. 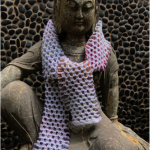 Learn to knit a Mini Color Splash Scarf for a good cause. All details about this free event are on the calendar. Download Eileen’s Mini Color Splash Scarf pattern here. Our last SAK gathering for this year will be on Thursday, October 20 from 9:30 am to noon. This SAK event will be very different from all of the others because we are going to focus on creating the “garden” in Sarah’s Garden Scarf. We’ll use embroidery to adorn our scarves. You’ll learn four embroidery stitches: spider web flower, lazy daisy, French knot, and stem stitch. View the event and add it to your calendar from the Guild Calendar. Download Sarah’s Garden Scarf Pattern here. 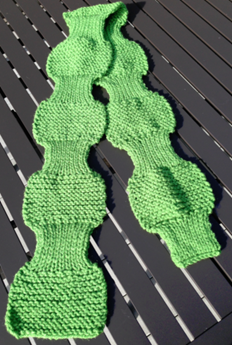 We will be knitting Julian’s Mitered Scarf for our next Share A Knit philanthropy project. This is a wonderful pattern loosely based on mitered squares but they are not squares. 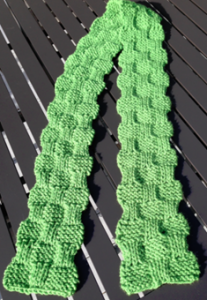 Download Julian’s Mitered Scarf Pattern here. Any yarn weight will work with a needle size slightly larger than typically recommended: sock weight with US 3 (3mm); sport weight yarn on US 5 (3.75mm), DK weight with US 7 (4.5mm), or knitting worsted weight with US 9 (5.5mm). Materials to bring: a ball of DK cotton yarn like Skacel CoBaSi, Tahki Cotton Classic Light, or Cascade Ultra Pima, one set of double-pointed needles suited for the weight yarn you have (US 4, 5, or 6), a stitch marker and large eye yarn darning needle. Eileen designed the pattern for Softies with comfort in mind. 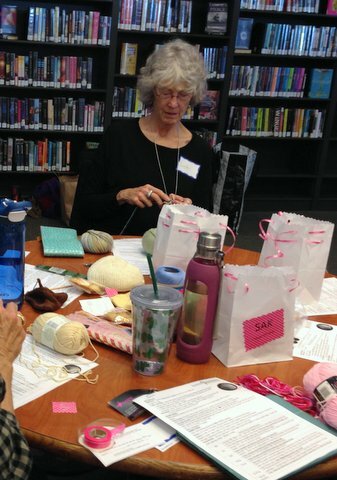 Learn more about Sofies and how to knit them at the Summer SAK Splash. Eileen and Arlene will help you every step of the way. View the event and add it to your calendar on the Guild Events page. 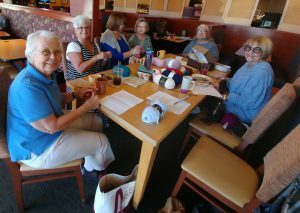 March Philanthropy Event–Knitted Knockers Recap: Click on any photo to see a short slideshow. Join us on March 10 for our third Share a Knit in support of Guild Philanthropy. 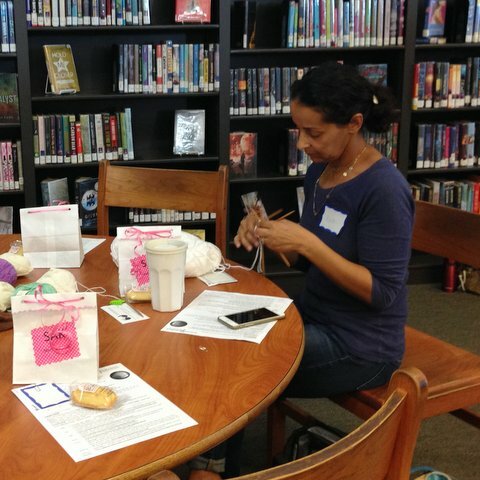 Learn to knit a pair of Knitted Knockers with Eileen Adler and Arlene Shaposhnick! 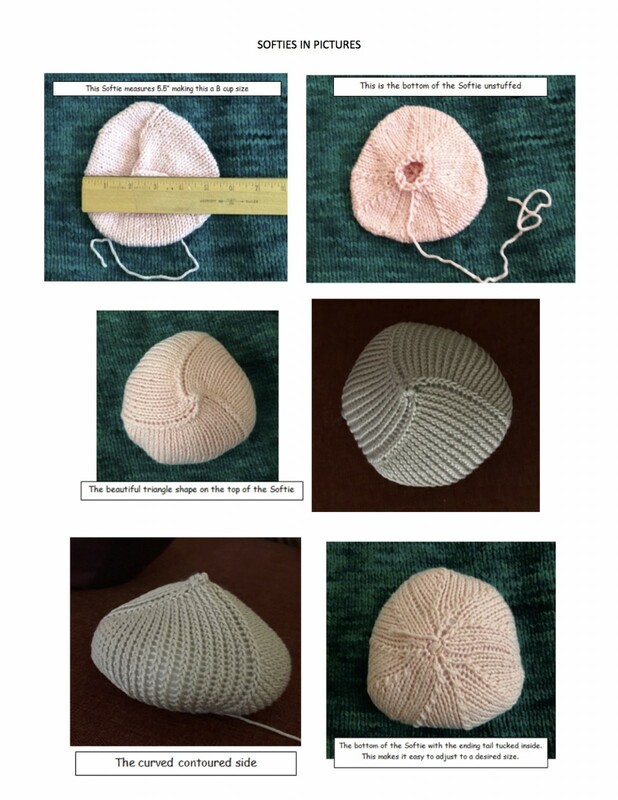 Knitted Knockers are a light comfortable knitted prosthetic alternative for women who have had a mastectomy. When placed in a bra, these knitted breasts take the shape and feel of a real breast. They are lighter and more comfortable than silicone prosthetic breasts. Patterns, videos and lots more information is on the Knitted Knockers website. NEEDLES: 1 set of double-pointed needles in US 4, 5, or 6 that are at least 6” long. RSVP is required. 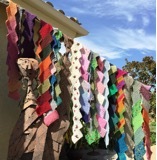 Contact Eileen at ShareAKnit@SanDiegoKnitters.com to let her know you will participate. 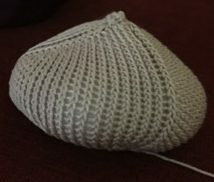 SKILLS YOU WILL LEARN: Working on double-pointed needles; knitting an I-Cord; Kfb – increase = knit next stitch in the front and back; K2tog – decrease = knit the next 2 stitches together; SSK – decrease = slip, slip, knit; and rosebud closure or threaded closure. View this March Share A Knit on the events page and add the event to your calendar. Over 20 scarves were created at our first Share A Knit in August. Join us for our second Share A Knit in support of Guild Philanthropy. Share A Knit is a casual, friendly and educational knitting opportunity. 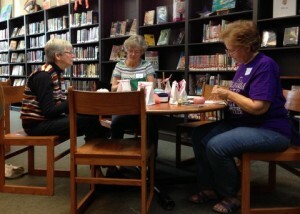 You get to support Guild Philanthropy and enhance your knitting skills among friends. 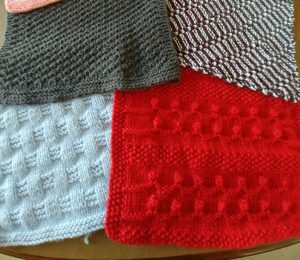 You’ll also be one of the first knitters to see a new scarf pattern designed by Guild member Eileen Adler. Eileen generously shares her new scarf patterns for this fun event. Dappled Sunlight Scarf adorned with ribbons and knitted flower. In November, Eileen will share her newest pattern called “Dappled Sunlight Scarf” and help you get started! The pattern introduces the concept of lace but not in the usual way. If you’ve never knitted lace, this may be a perfect introduction. RSVP to Eileen is required. US 7, 8, 9 or 10 needles (circular or straights, whichever you prefer). Knitting notions: scissors, tape measure, tapestry needle. OPTIONAL YARN. 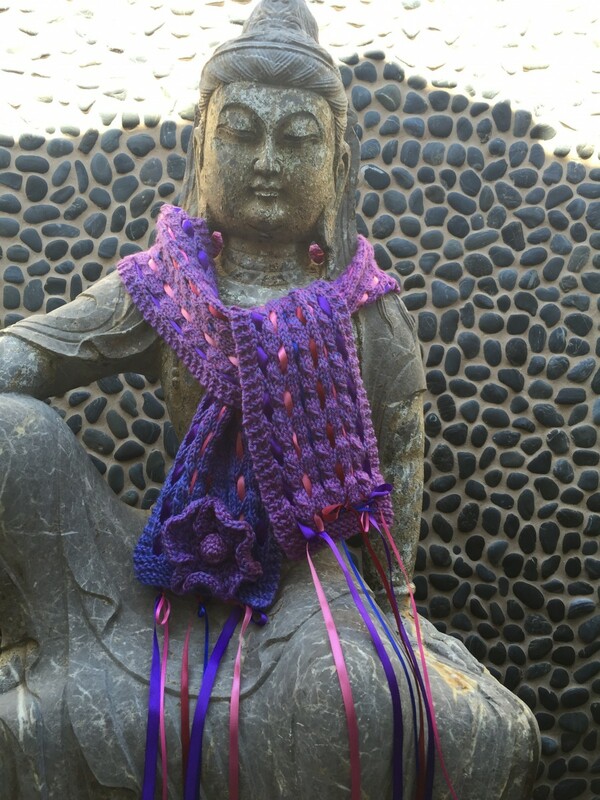 The scarf is knit using worsted weight yarn. You may bring your own or use yarn provided by the Guild. Most of the available yarn is acrylic or other synthetic fiber. Bring your own if you prefer to knit with wool or other natural fibers. 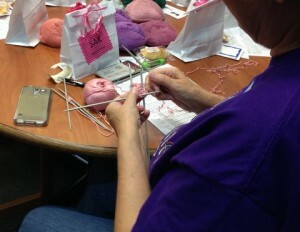 Cost: There is no cost to Guild Members to participate in Share A Knit. Meeting at Coco’s Restaurant allows us to enjoy no-host coffee, brunch, or lunch, but you do not have to purchase food or stay the entire time. 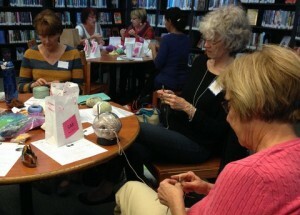 View Share A Knit on the events page here and add the event to your calendar.